The September 2014 Feature Pack, which we announced yesterday along with our World Tournament Series, is bringing exciting additions to PvP! Today, we’ll be talking about two of our additions aimed at supporting our competitive community: Standard Enemy Models and PvP-exclusive armors! Gameplay Programmer Branden Gee will kick things off by introducing the Standard Enemy Models, and then Designer Hugh Norfolk will tell you about our glorious new armors. Something you’ve probably noticed if you’ve played much PvP in Guild Wars 2 is that races in our game can have widely varying animations for the same skill. In competitive play, this can make it hard to accurately anticipate and react to opponents. As part of our support for high-end competitions, we wanted to use this feature pack to introduce a way for players to more consistently identify and react to enemy skills. This left us with a pretty tough question to answer: How do you normalize the animations and sizes of characters to improve readability while still maintaining the visual identity of each profession? Let me tell you right now, upscaling asuran characters was not the answer we were looking for! Our solution is what we’re calling “Standard Enemy Models.” It consists of a human model, a weapon set, and a set of armor per profession and gender. We put together looks that we feel preserve the feeling of each profession and are visually distinct from other professions. So what does all of this mean for you? It’s pretty simple. There’s now a setting in the General Options tab of your F11 menu. If you enable the Standard Enemy Models and enter a game type that supports them, all of your opponents will be represented by these models based on their gender and profession. This set will only replace enemy models; your teammates will not be affected. As this functionality is intended for high-end, skilled players at the top tier of PvP, this option will work only in Team Arenas and Custom Arenas that allow Tournament Commands. Hey, everybody, Hugh Norfolk here to tell you about our new PvP-exclusive armors. “Wait, Hugh,” I can hear you asking, “did you really just say that we’ll be getting new armors in PvP?” Yes! There will be two sets of armor that will be released exclusively to PvP: the Glorious armor and Glorious Hero’s armor. When designing this armor set, we really wanted to bring something unique and, well, glorious to PvP. We started out by asking questions like, “What would a god of war wear into battle?” and “What would embody the glory of combat?” As we looked for the answers to these questions, we turned to mythology for inspiration. We also looked to the most glorious place of all: the Hall of Heroes from the original Guild Wars. One of the key visuals from the Hall of Heroes is its majestic statues with ornate wings, which we decided to incorporate into our new armor sets. In response to the PvP community wanting a very prestigious set of armor, we decided that we would create two variants of this armor. 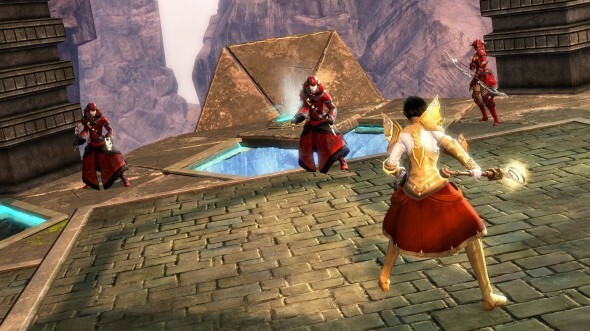 The Glorious Hero’s set is a top-tier reward for certain competitive tournaments like the Guild Wars 2 International All-Star Tournament at gamescom. If you aren’t one of the teams competing in that tournament, don’t despair—the Glorious Hero’s set will be available as a prize in similar tournaments in the future. The Glorious Armor set is something we wanted all players to be able to earn. 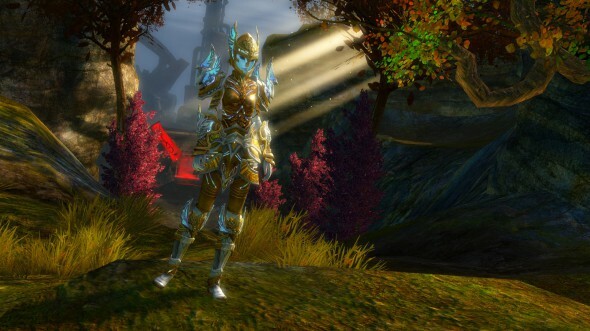 As such, all players have the opportunity to obtain the Glorious armor set from a repeatable Glorious Armor Reward Track that will arrive with the feature pack. This track will have rewards similar to those found in region reward tracks, like Dragonite Ore, Empyreal Fragments, Obsidian Shards, and Mystic Clovers. You’ll also be able to earn Custom Arena Time Tokens to support your favorite Custom Arenas. Each time you complete the Glorious Armor Reward Track, you’ll be able to select a piece of Glorious armor to add to your wardrobe! We are very excited to bring you these armors in the upcoming feature pack, and we can’t wait to see you don the mantle of glory! We’ll see you in the Mists!